5.2 Energy infrastructure has inertia. The decisions that governments, corporations, and individuals made in the past have created today's energy infrastructure. The large amount of money, time, and technology invested in these systems makes changing the infrastructure difficult, but not impossible. The decisions of one generation both provide and limit the range of possibilities open to the future generations. 5.4 Energy decisions are influenced by economic factors. Monetary costs of energy affect energy decision making at all levels. Energy exhibits characteristics of both a commodity and a differentiable product. Energy costs are often subject to market fluctuations, and energy choices made by individuals and societies affect these fluctuations. Cost differences also arise as a result of differences between energy sources and as a result of tax-based incentives and rebates. 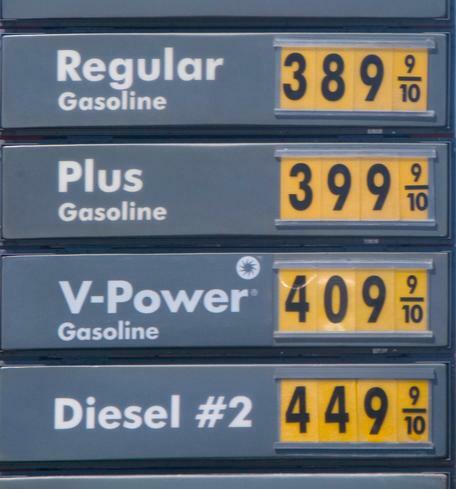 Gasoline prices are perhaps the most noticeable way that consumers are exposed to fluctuations in the price of energy. Photo by Greg Woodhouse Photography. Provenance: Photo by Greg Woodhouse Photography. Individuals make decisions about energy every day. These decisions may be driven by need, cost, convenience, or social norms. Societies make energy decisions following formalized procedures, but these decisions are influenced by many different, and sometimes competing factors. Economics play an important role in shaping energy policy. Market forces, taxes, regulations, and subsidies can affect the prices of different forms of energy. Environmental and societal costs are part of decision-making as well, as each form of energy has different impacts on the land, air, water, ecosystems, and people. The political process surrounds all of these factors, which adds influences relating to the balance of power, ideology, corporate influence, and governmental structure. In a nutshell, the decisions surrounding energy use and energy policy are part of a complex, multifaceted process. Will we have enough energy to fuel our society and our economy? Can we continue to use energy without causing irreparable harm to Earth's climate system? How much effort and resources are we willing to invest into alternative energy sources? Can sufficient energy be distributed fairly, safely, and economically to all parts of the globe? The answers to these questions are dependent on the decisions we make about energy. These ideas are of critical importance for students, and in fact, for all people. Energy decisions can have profound impacts on our lives, the economy, national security, and the environment. Every day, individuals make decisions about energy in the actions we take, the products we purchase, and the policies we support. Because of this, every person plays a role in the complex system of energy decisions. Teachers may be familiar with student utterances of, "Why can't we just switch to renewable energy?" or, "I think we should close all the nuclear power plants." In order for students to engage in informed decisions they need to be aware of the realities of balancing energy demand, economics, and the advantages and disadvantages of various energy sources. Teaching about energy decisions offers opportunities to infuse science principles with social, economic, and political factors. These issues can be personal for some students. Policy viewpoints can be challenging to teach due to communications roadblocks such as the worldview backfire effect (learn more in this summary from the CLEAN Climate Communications workshop). It is important for educators to not be political advocates but to focus on building knowledge around the science, engineering, economics, and policy of energy decisions. 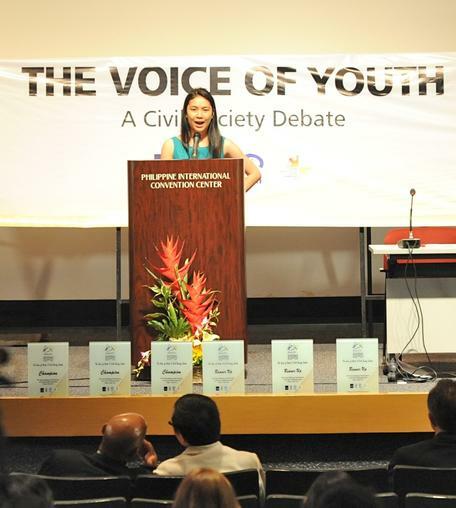 The Voice of Youth: A Civil Society Debate that featured students from the two top debating teams in the Philippines: De La Salle University and the University of the Philippines Diliman, demonstrating the key role of the youth in development. Photo from the Asian Development Bank. Provenance: Photo from the Asian Development Bank. Energy policy spans engineering, economics, environmental science, political science, and social science. Moreover, psychology, communications, and ethics also play a role in shaping energy decisions. Thus, this topic can be taught within nearly any discipline. That said, students would benefit from an understanding of the science behind the energy issues before they grapple with the policy aspects. An activity about energy policy could serve as an effective capstone project for a unit about energy science. Political science or Social studies - How is energy used across the world? How does energy use vary in different cultures? How are energy decisions made? Math or economics - Calculate the costs of different types of energy. What factors are included in the price of energy? Are environmental impacts included in the price of energy? How does the price of energy influence the consumption of energy? Psychology - What factors influence how much energy a person uses? What are some ways to motivate change in energy use? Are there psychological factors that influence citizens' outlooks on different energy sources? Energy decisions are at the root of solutions to many environmental challenges, particularly climate change. Topics such as the increasing demand for energy, the need for clean and sustainable energy sources, or the ways in which societies use energy are all possible methods to empower students to think about ways to solve some of our current challenges. As with Energy Principle 4, a quantitative approach allows students to go beyond wishful thinking about energy. A well-rounded learning experience will allow students to back up their ideas with scientific or economic data that demonstrate the feasibility of different decisions or policies. Role playing and case studies are fitting pedagogic tactics for teaching these concepts. These approaches help break down the wide array of viewpoints and variables into manageable pieces. Car of the Future puts students into research teams to develop a proposal to decrease the carbon footprint of their city's public transportation system. Students prepare a report that explains why their transportation plan is the best for their community. 12 Steps to a Sustainable School helps teachers and their students measure and reduce the energy consumption and carbon footprint of their school. Designed for high school, but adaptable to middle school. Dreaming in Green - Young Voices on Climate Change highlights four middle-school girls and their efforts to to reduce the carbon footprint of their school. Power for Developing Countries asks students to design economically-viable engineering solutions to address the energy needs of three off-the-grid towns in Africa. Several activities about renewable energy use a GIS-based mapping tool to answer real-world scenarios about providing renewable energy in various scenarios. The Great Energy Debate - Students develop arguments on the pros and cons of different energy sources. Carbon Stabilization Wedges Applet and Carbon Stabilization Wedges Game are activities that help students evaluate different pathways to reduce carbon emissions. Students select from various options like replacing coal with solar power, reducing deforestation, and increasing conservation tillage in agriculture. 2050 - This interactive tool allows students to make various decisions to try to reduce nationwide CO2 emissions to 20% of 1990 levels. The figures and examples are from Great Britain, but the lesson is applicable to the US as well. This activity is simple to use, but shows the challenges in meeting the target. The Energy Lab is a similar activity, but is more complex. Yale Climate Opinion Maps can be used to show how people in different parts of the US (and Canada) feel about climate change, risk perception, and climate policy. Maps are updated every two years. Simulation of International Negotiations to Reduce Greenhouse Gas Emissions allows students to learn about the interests of different countries and the range of policy responses to mitigate future climate change. Greenhouse Emissions Reduction Role-Play Exercise - Students take the roles of various important players in the climate change policy negotiation including politicians, scientists, environmentalists, and industry representatives. Working in these roles, students must take a position, debate with others, and then vote on legislation designed to reduce greenhouse gas emissions in the United States. Adapting to a Changing World - This activity explores national attitudes about climate change, illustrates the difference between climate change mitigation and adaptation strategies, and provides structured opportunities to identify effective adaptation efforts in the US and elsewhere. Evaluating the Effects of Local Energy Resource Development is a semester-long jigsaw project in which students work in teams to explore the effects of energy resource development on local water resources, economics, and society.